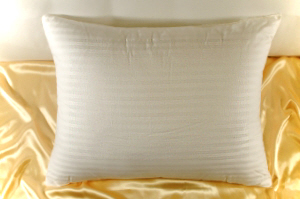 We are offering a special on our Down-Like, Micro Denier ( GEL) Fiber Pillows, with a beautiful white on white pattern, 200 thread count, back filled and calender cover, usually used in the more expensive feather pillows. These are VERY high quality, extremely comfortable, at a very low promotional price… They will represent our company well. These Gel Pillows are not just great for all the spare bedrooms, or for extra bed pillows, these micro fiber pillows are so comfortable, most likely you will find yourself sleeping on them!. 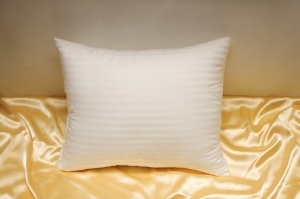 See also our WINTER Sale 25% off on STD, Queen, King, Euro DOWN PILLOWS including 700 & 800 fill power ! We have gotten request for a polyester fiber version of our 12″ x 16″ and 16″ x 20″ Travel Pillows; using the premium down-like MICRO fiber, and the same beautiful 200tc, white on white cover. This will satisfy those that use the pillows for decoration, as well providing real comfort to those who actually sleep on the these pillows while traveling. 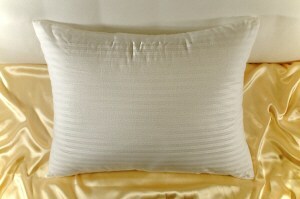 We also have got several request for “specialty pillows” , from both the medical profession, and individual consumers. We are introducing the lumbar pillow (above) and the neck-around pillow, others products will follow. 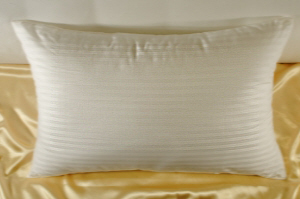 For the neck-around pillow, we are using the down-like microdenier fiber, but a 233 tc 100% cotton, all white cover, with a real nice finish (It will also be available in the medical grade cover). This is also a great travel pillow . 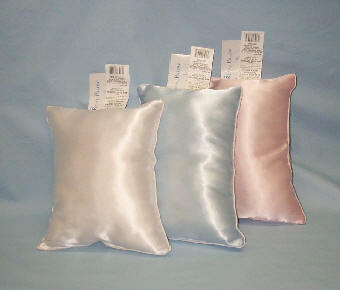 BEAUTIFUL SATIN pillows with a cord. 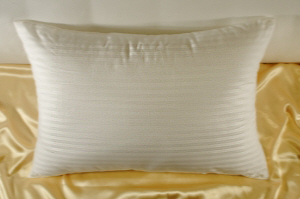 These pillow uses micro strands polyester fibers, giving them a down-like feel ( very close); it is very soft, but has no bounce, and like all polyester, it is hypo- allergenic. Available in three colors; white, blue, and pink, they are very cute, and make great gifts.